Linking top Greek wine producers, wine merchants abroad, and wine consumers. On Thursday, I had a leisure day in Hamburg. I met with Christos Kokkalis at lunch time and we strolled around the city, had coffee, and as always talked a lot about Greek wines. Late afternoon I received a call from Mario Scheuermann, who asked if I could provide him with some more Greek wines, as he had enjoyed the tasting so much. In the evening we met again with the lovely Sommelier couple Dagmar Willich and Rene Baumgart. We were in for a treat, as they had organised a table with a great view in the Carls Brasserie, the newest member of the Jacob dynasty. 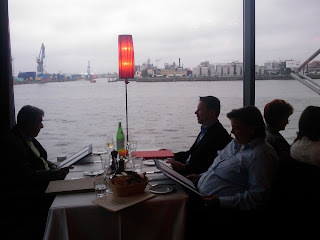 What a great setting this place has - our table was perfectly located to enjoy the views of the harbour and the Elbphilharmony. The food was delicious, and the conversation was flowing easily. Both Dagmar and Rene are such friendly, knowledgeable, and interesting people, I am really glad to have met them. Friday morning I drove to Mario Scheuermann and provided him with another 6 Greek wines. After this, I had an appointment with a wine importer. I had a very fruitful discussion, and I left 30 labels there, from which a selection will be presented by me in August. It was time to make my way back to Siegen. There was heavy traffic and the drive took nearly 7 hours. On Saturday morning I took the plane from Duesseldorf to Athens, ready to tackle the workload that expected me there. It still amazes me how quickly work can pile up! On Wednesday morning I woke up at 5:00 am and drove 5 hours to Hamburg. 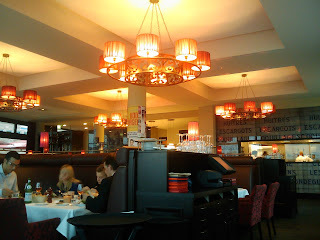 I arrived at the Hotel Baseler Hof around 11:30 am. A Twitter meeting was planned for the afternoon. This was organised by Mario Scheuermann alas weinreporter, who is a very well known wine critic and journalist. The agenda was for me to present and discuss Greek wines. Also invited were Dr. Eckhard Supp alas enoworldwine, who is the publisher of ENO WorldWine, as well as Michael W. Pleitgen alas weinakademie, who runs a Wine Consulting and Education Business in Berlin. Mario Scheuermann's charming wife odorfa also was expected to join us. I had invited my good friend Christos Kokkalis as a surprise guest. The Tschebull Restaurant was chosen as the venue. At midday, I transported the wines to be presented to the Restaurant in order to cool the whites and decant some reds. The setting was impressive, the Tschebull is a very modern and light-flooded place, at a very central location. At 2:30 pm I picked up Christos Kokkalis from the Central Railway Station. He checked into his hotel and we arrived at the Tschebull just after 3:00 pm. After a short while, Mario Scheuermann and Eckhard Supp joined us. 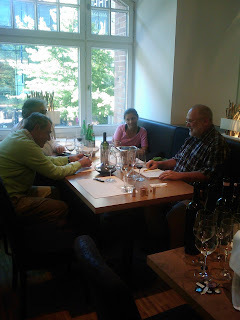 Michael Pleitgen was delayed, as he was training some chefs and sommeliers in Luebeck. We had a very lively and constructive discussion about the Greek wine market. The presentation/tasting started at 4:00 pm. 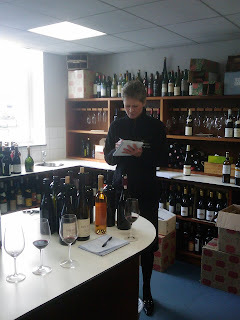 I had selected eight different wines, 2 whites and 6 reds, out of about 30 labels that I carried to Hamburg. Christos brought a bottle of his 2006 Trilogia. We took time to taste and discuss every single wine, and odorfa joined us half way through. It is always fascinating to hear top tasters arguing with each other about personal preferences, as this just shows that complex wines waken different perceptions in different people. Everyone at the table agreed that all wines presented were captivating - and half of the wines shown received particular high praise. I was of course very pleased with this, as I believe so strongly in the quality of selected Greek wines available today. Michael Pleitgen arrived at 6:00 pm, he interviewed me and tasted a few wines as he had to catch the train to Berlin at 07:00 pm. Eckhard Supp, Mario Scheuermann and odorfa stayed until 08:00 pm. Christos and myself were then joined by the Sommelier couple Rene Baumgart und Dagmar Willich for dinner at Tschebull. I arrived back at the Baseler Hof at 10:30 pm and surfed the Internet. Mario Scheuermann had already twittered about the Greek wine tasting, the next morning I found articles by Michael Pleitgen and Eckhard Supp, also reporting about the event. I spent all of last week in Germany with a tight and full schedule. On the 20th June I flew to Duesseldorf and arrived at my base close to Siegen in the afternoon. A week before that, I had sent a pallet of mixed wines from Greece to Germany (one pallet carries roughly 600 bottles), a total of 30 labels from 10 different winemakers. I needed quite a few hours on Saturday and Sunday to group some of the wines into different parcels, deciding where to show which wines. Monday morning I made my way to Montabaur, an hours drive by car, to catch the ICE train to Munich. The train ride was quite pleasant and I used the 4 hours to prepare myself for the week. 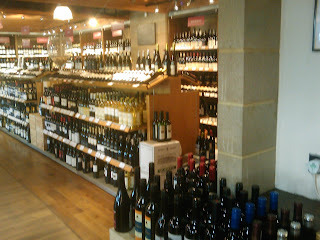 My appointment was with a wine merchant at a very central location in Munich. It is so important to meet face to face - it is the only way to really learn what personalised services one might be able to offer. After about 45 minutes I left some samples and made my way back to the Hauptbahnhof (central railway station) with suggestions and comments received. I waited a couple of hours before taking the ICE back to Montabaur, arriving at my base at 12:30 pm. I worked for another hour on the PC before hitting the bed. The next morning I took a two and a half hours drive to Kempen to meet with a potential client. The meeting went very well, again I left my samples there. Usually I try and taste the wines with the customer, in order to guide through. But Monday and Tuesday were exceptions, as both times the time schedule did not allow for this. I drove back in the afternoon and arrived in Siegen in the early evening. Samples had to be selected and packed for the next 3 days. The boot of my car was full with wines by the time I was finished. Adegga, the Social Wine Discovery service, has recently introduced AVIN codes for wines. AVIN is a free unique code for wines, similar to an open ISBN for books. When naming wines, people often use different names while refering to the same wine. This is certainly true for Greek wines abroad, as the consumer can easily be confused about the name. I fully support Adegga's efforts to unify wine names in a single database, thereby providing simple ways to access this information. I have already updated all tasting notes from the Dionysia with the AVIN codes, and plan to use AVIN codes on any new references to wines in this blog. This should be very helpful to pinpoint any single wine. Please comment your suggestions/feedback. Eric Boissenot, one of the most famous oenologists of the winemaking world, was recently invited at the Alpha Estate in Amyndeo, Greece, by the vineyard's oenologist Angelos Iatridis. Eric Boissenot maintains his wine laboratory in the region of Pauillac, Bordeaux. He has many high-class co-operations, amongst others with Chateau Lafite, Chateau Latour, Chateau Margaux, Chateau Palmer, Chateau Ducru Beaucaillou, Chateau Gazin, and Chile's Concha Y Toro. He is a low profile oenologist whose wine philosophy is primarily based on the accentuation of the terroir elements. The friendship between the two colleagues, Iatrides and Boissenot, dates back to the time when they both studied at the faculty of oenology at the University of Bordeaux. Their relationship now seems poised to become one of a professional nature from the next harvesting season. As a first reaction, Eric Boissenot was positively surprised by the evaluation of the property's ground and climatic elements; the wineries wine production processes and infrastructure. He stated that he views his involvement in the wine production at the Alpha Estate as a challenge. This is just another sign that the quality of some Greek wines has skyrocketed in the last few years. It also shows that the people responsible for this success do not rest, but push further to keep this important process going on. On the 26th of May I had the great pleasure of presenting some Greek wines to Joanna Locke, Master of Wine, at the Wine Society in Stevenage, UK. I woke up at 04:30 am and made my way to the Athens airport. I arrived in London Stansted at 09:30 am local time, boarded the Stansted Express into London Liverpool Street, took the tube to London's King Cross and from there the train to Stevenage. I met Jo at 1 pm and presented three wines each from two estates: From Parparoussis (1) Nemea Reserve 2003 (100% Agiorgitiko), (2) Taos 2004 (100% Mavrodaphne), (3) Muscat of Rio 2003 (sweet white from 100% Muscat of Rio of Patras). 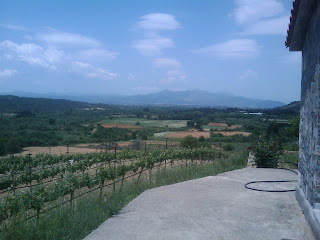 I also showed the Kokkalis range: (1) Mova 2006 (Agiorgitiko, Cabernet Sauvignon), (2) Syrah 2006 (100% Syrah), Trilogia 2006 (100% Cabernet Sauvignon). All wines showed very well. Interestingly enough, the styles of the wines from the two winemakers come from opposite spectrums: Parparoussis produces very elegant, feminin wines that focus on the pure fruits, Kokkalis wines are powerful, concentrated and masculine. However, all wines were very seductive. The bottles were opened there, so the wines really did not have time to settle and breathe properly. Luckily Jo told me that she likes to evaluate wines over a minimum 24-hour period, revisting them several times to see how they evolve. I find this to be a very honest process of evaluating wines, rather than just having a quick swirl and sip. Jo is a very charming and warm person with about two decades of wine experience - I believe she became a MW in 1990, and also chaired the Institute of Masters of Wine in 2008. It is so nice to see that one is still able to find professional wine-buyers that are very much down to earth and who simply love the work they are doing, especially in today's market environment. I am glad that she took the time to see me, and found our discussions very helpful. After our meeting, I visited the wine shop of the Wine Society (this is the only shop in the UK, a second one operates in France), where only members can make purchases. I made my way back to the airport (via the same route I came in) and arrived back home in Athens at 02:30 am. Quite a long day, but very much worth the effort. 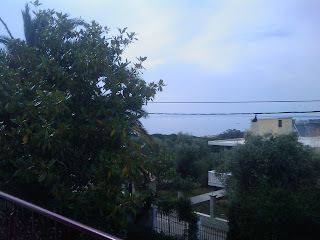 Yiannis Tselepos invited me for talk and food to his estate in Rizes, very close to Tripoli, on the 19th of May. It was a hot, but extremly windy day, I could not go faster than 120 km/h on the motorway. 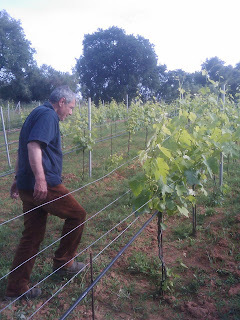 After I arrived at the winery, Yiannis took more than an hour to show me his vineyards. The altitude is about 800 m, and there are a total of 50 ha, plus another 30 ha of forest. On the photo on the left the city of Tripoli can be seen in the background. I turned around in any direction, and all I could see was the vast territory of the Tselepos estate. It it an amazing sight! Up to 25 employees work in the vineyards, and all work is done by hand. For example, weed is pulled out by hand only - quite a task for such a large area. Grape varieties are Moschofilero, Gewurztraminer, Chardonnay, newly planted Riesling, Merlot and Cabernet Sauvignon. The soil consists of schist. 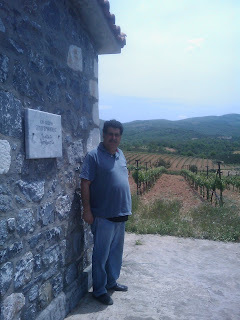 Tselepos also owns 8.5 ha of the Driopi Estate in Nemea, where Agiorgitiko is planted. Included in the vineyards in Rizes is a beautifully built private church with hand-painted pictures of wine related biblical themes. In addition, a mill from 1780 was restored, this is yet another showpiece. Yiannis told me that he wanted to show me everything so that I get a feeling for the man behind the label, he does not usually show people around. I was very impressed, the love for even the smallest detail cannot be missed. He lives and breathes wine and certainly is extremly passionate. We then drove to Tripoli and had a light lunch in the oldest taverna in town (1933). Food was perfect, oven baked anchovies, beet and wild mountain herbs. We drove back to his estate and had coffee there. He is also currently building a new winery plus cellar from scratch. Work should be completed this year. As a summary, this is a very serious estate where the passion for wine is matched by the meticulous work in the vineyards. On the 15th May I made my way to Skafidia to pay another visit to Christos Kokkalis. It is always such a pleasure to spend some time with him! The car journey was very pleasant. May is such a nice month, as everything is in full bloom, the landscapes are beautiful to look at. 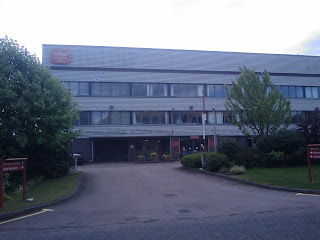 After the 3 1/2 hour journey, I arrived around midday. Christos's sister and niece had stayed with him for the last days and we drove them to Pyrgos where they wanted to catch the bus to Athens. Afterwards we made our way to the sea and had a nice lunch at a fish taverna, which was followed by a relaxing siesta at Christos's house. Late afternoon we drove to his vineyard, the one where I planted vines in March. They had already grown nicely, most were about 20 to 30 cm in height. Christos showed me how to thin out the vinebranches and leaves from the Syrah vines that were growing vigorously (they were planted 7 years ago). I love learning about the work in the vineyards, and I feel very privileged having such a great teacher! At about 10 pm we went to a restaurant where some friends of Christos were waiting for us. It was a great evening, I had brought along a bottle of Kuehling-Gillot Kreuz Spaetburgunder 2006, which Christos really liked. He brought a bottle of his Trilogia 2006 - what a wine! The nose was full of cassis and coffee, it is extremly rich on the palate with bags of tannins. This is the best Trilogia to date, we were all struck by its density. Christos also brought a bottle of Volnay Marie Mairgnot Les Chenes Premier Cru 1997. 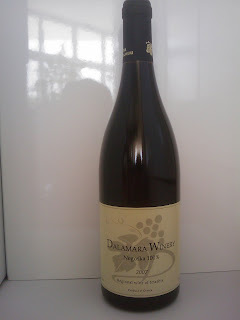 It had a bit of a rough time as we served it after the Trilogia, nevertheless it was a good wine that it is still going. I stayed overnight at Christos's house and we went to bed about 1:30 am. In the morning we had breakfast and coffee, some more discussions about Greek wines, and I left at 09:30 am and made my way back home. This morning I was visited at my home by Kostis Dalamara from the Dalamara Estate in Naoussa. The Dalamara Estate has been handed down from generation to generation since the 1840s. Kostis is the 22-year old son of Yiannis and Katerina. He is currently living in Beaune, he studied oinology for two years in France and is now completing a further year of work there. 80% of the grapes grown at the 3 ha Dalamara Estate are Xinomavro, with further plantings of Assyrtico, Malagousia, Roditis, Merlot, Cinsault and Negoska. The work is fully biological. 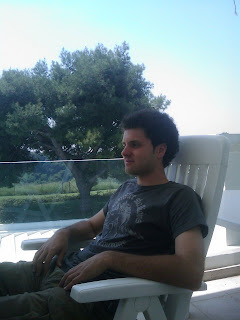 Kostis is driven by a desire to learn, it was his own choice to go to France and study there. He spent 6 months in the country to learn the language, before starting university. He is a great example of the next generation of vintners who will stop at nothing to further improve the quality of the wines produced. He kindly brought a bottle of 100% Negoska 2007, that was just bottled 6 weeks ago. Only about 600 bottles of this wine are produced, and all of them are sold to the US. We had a very good discussion about Greek wines and I am really glad that he made the effort to visit me. Mark Squires, who among other countries covers Greece for Robert Parker's Wine Advocate, kindly gave me permission to link two articles he published and that are well worth reading. Santorini: Not just for the panoramas....go for the wine! Over the last years, I have come to really appreciate Greek wines. There are many grape varieties that exist only in Greece and I have the good fortune of being able to try them all. I wish to share my enthusiasm with wine lovers around the world, who often limit themselves to maybe four red and four white grape varieties for most of their life.